Turn this unfinished picture frame into a work of art with a fun DIY project. Made of American poplar with a flat-faced, squared, profile, your choices are endless. Let your kids choose the color paint and let them go to town with glue, glitter, buttons and baubles. You’ll love it for that favorite canvas, as a family photo frame, a whiteboard frame or a frame for your kid’s latest masterpiece. Handmade by our Artisans from natural wood grown in sustainably managed forests. Custom sizes to 1/8th of an inch! I ordered two of these frames. As I don't like laminated or resin frames, I buy these unfinished frames and stain and varnish them myself. One of the frames had a badly joined corner; I called customer service and the frame was replaced immediately. Both frames are now done, and both are lovely. I ordered the unfinished UW4 frame with a mirror and stained it to match our vanity. I was a little worried that the poplar wood might be difficult to stain but after trying 2 minwax colors we got a perfect match and the finished frame looks great. I am very pleased with the quality of this unfinished wood frame. I thought I was going to faux finish it but it looks so nice that I may leave it as is. It was packaged well and arrived promptly. I will definitely purchase frames from this vendor again in the future. Hello Pamela! Thank you for shopping with us. We understand your concern. We always look to deliver the best products in excellent condition. It appears that we missed the mark and we apologize for that. 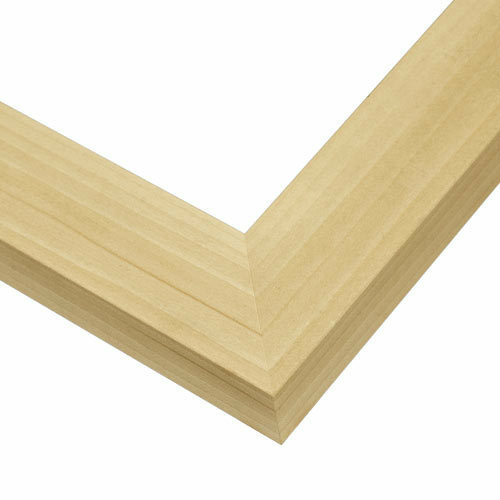 If you would please email us photos of the frames corners and the glue spots, we are happy to send you a free replacement frame. When you email us, please emphasize the frame size. We can be reached at 1-800-332-8884. We look forward to assisting you. Thank you for your business. This is a good frame. I've had some problems with the corners not meeting evenly. Most frames have not had this, but some have. Thank you for submitting your review. If you are not completely pleased with the frames corners, we would like to offer you an exchange. Please give us a call at 1-800-332-8884 if you would like to receive a new frame. We ask that you send us photos of the frame so that we make make the necessary production improvements. Thank you again! This frame is very well made, economically priced, and it allows me to customize it with paint or stain. It is a sturdy frame, and that suits my larger size work. These are very good frames that I am able to stain to match customers requirements.